Rujak is Indonesian style fruit salad and very popular in Indonesia. Every region in Indonesia has their own version of Rujak, they are very interesting in both flavour and presentation. In Java, rujak is also plays an essential role to be a culture dessert of the traditional prenatal ceremony called Tujuh bulanan, its served and enjoy among the invited guests. I grew up with rujak in East Java, there’s always time to enjoy the feast of rujak with family and friends, and the moment turns fun when it called for ‘Rujakan’. 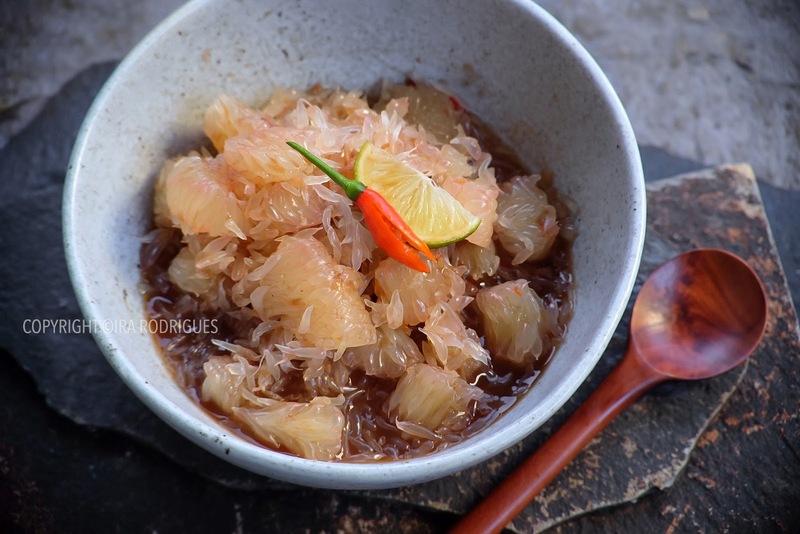 Today I will share Rujak Jeruk Bali (Balinese style Pomelo salad ) The flavours just refreshing between sweet, spicy, sour and balancing with tiny pinch of sea salt. Jeruk bali (Balinese Pomelo) is iconically to Bali island, its taste sweet, mild grapefruit alike and definitely much larger than the grafruit. With traditional stone plate and the stone grinder (cobek), crush the chilli, coconut sugar, salt, and dried shrimp paste into a tick paste. Add tamarind juice and grind the ingredients until the mixture resemble thick sauce. In a mixing bowl, place the jeruk bali and pour in the sauce over. Add the lime juice and have a taste, somehow it should taste sweet, sour, spicy and tasty.